It’s not necessarily as straight forward as it sounds. 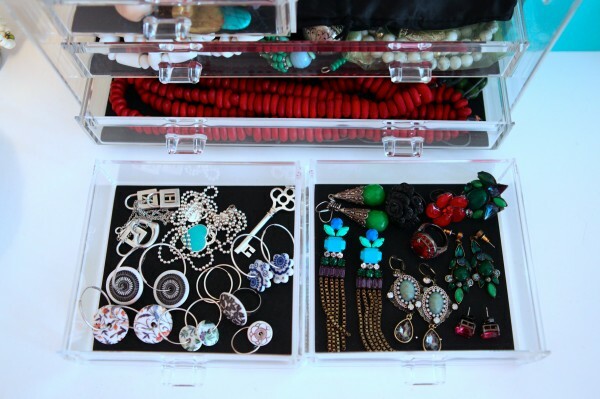 Storing necklaces, pendants, earrings, bangles and scarves can be tricky, particularly if you want to see what you have at a glance. 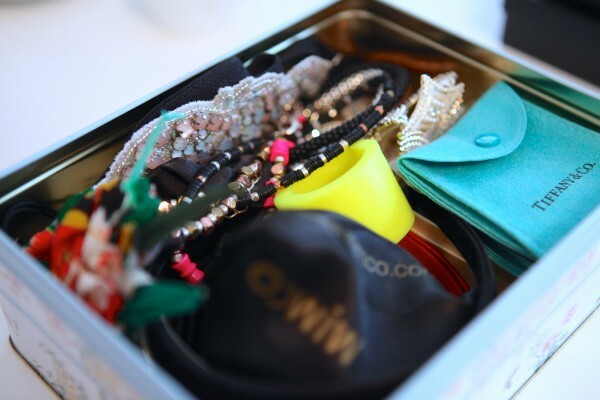 In today’s post, I’m sharing how I store MY accessories. As you may have noticed from following this blog, I am a collector of accessories. Over the many years I was either pregnant or had a new baby, accessories and shoes were my consistent go tos: they always fit and shooj-ed up plain maternity and in between clothes. I also came to see that great accessories never date. So I have quite the collection. It has taken a bit of work to find ways to store them all in a way where I can see what I have. It’s also taken a while to find ways that work. What you see below is the result of many years work – both of collecting and working out ways to store them. 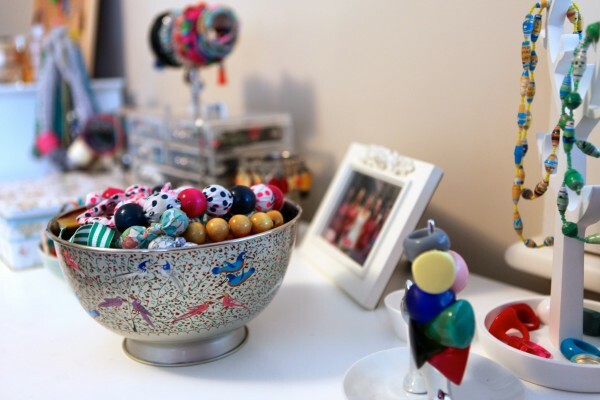 You’ll see that I use a mix and match approach – some of the storage pieces I use are specifically designed jewellery storage units from Howard’s Storage World while other pieces are inexpensive ceramic dishes or pieces designed for another purpose. Several pieces were given as gifts – very useful gifts that have stood the test of time. 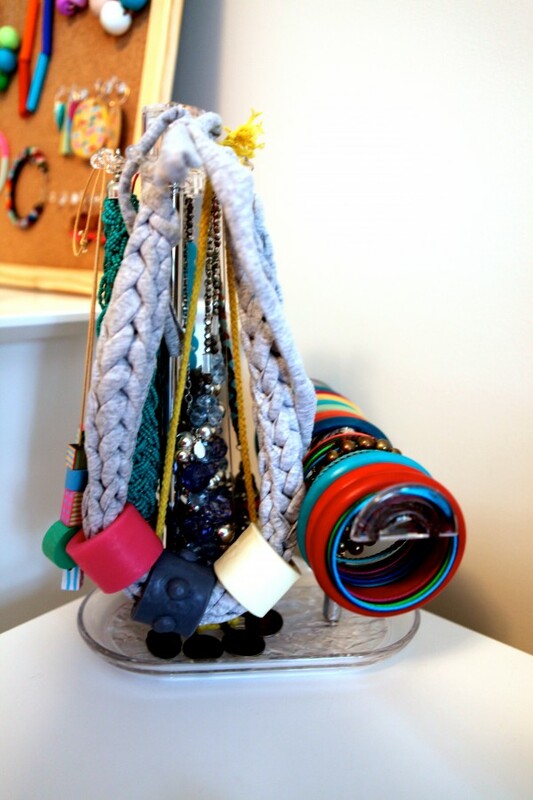 I hope this gives you some ideas about how to store your accessories. I’d love to hear your tips too in the comments below. 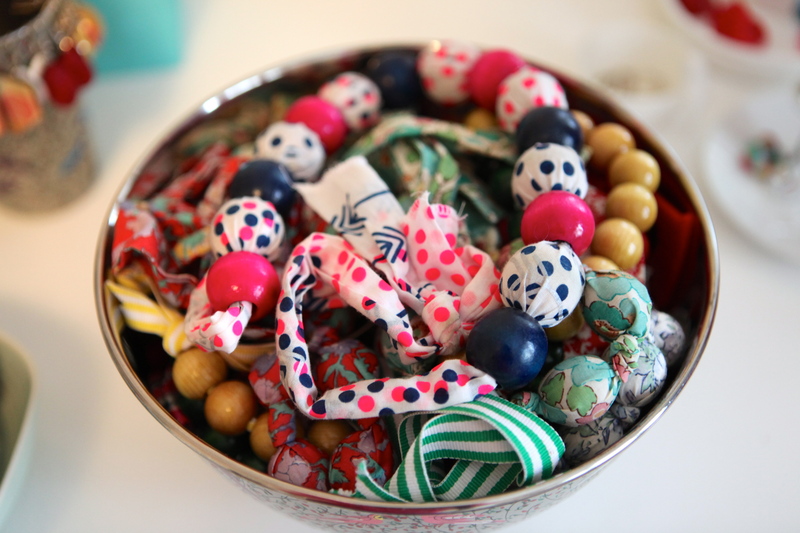 There are a few different ways in which I store my necklaces. What you see below is the result of a little spur of the moment workshop after I spent a good half an hour de-tangling my pendants. 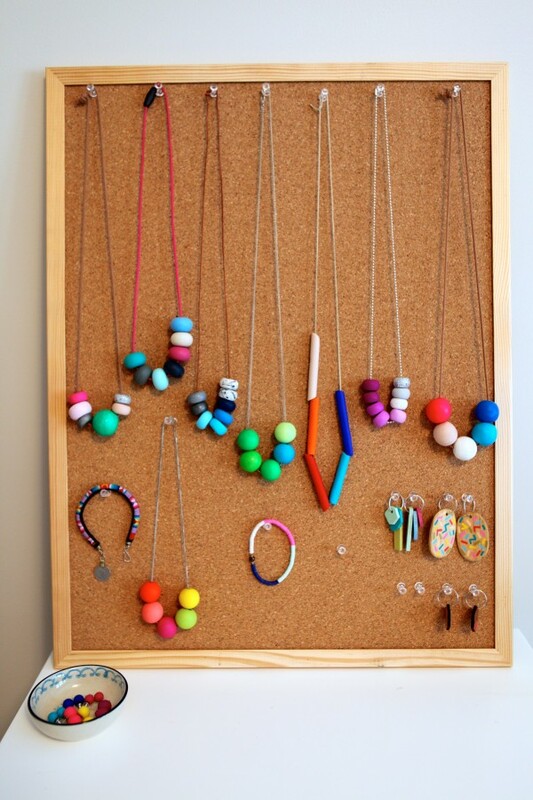 I grabbed an IKEA corkboard I had stashed away (for the kids) and some Kikki K push pins from my desk and voila. I can see everything and goodbye tangles! I also added some of my bigger wooden statement earrings and a couple of bracelets in similar colourways (I often wear combinations of these pieces together). I have simply placed it on top of my drawers and propped it up against the wall. All up, this cost around $10. I store my fabric necklaces that are a little bulky but not delicate in a big decorative bowl from Tree of Life (below). It’s an oldie but a goodie, but try Ishka or anywhere selling Indian handicrafts if you’re after something similar. 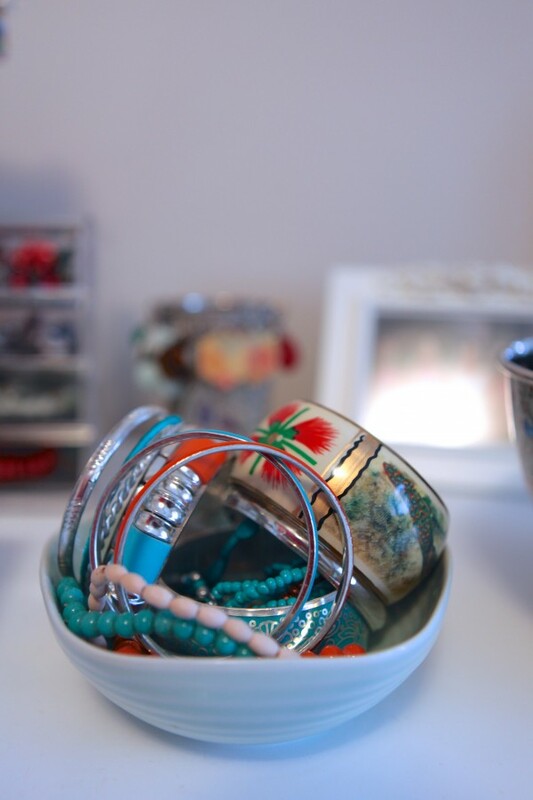 The unit below (from Howard’s Storage World but currently not online unfortunately), is perfect for shorter necklaces and has the added bonus of storing a few bangles. This wire bust is a great feature in our bedroom. It was a 30th birthday present some *cough* years ago from a gorgeous shop called Pepperberry Wares in Canterbury, Melbourne. 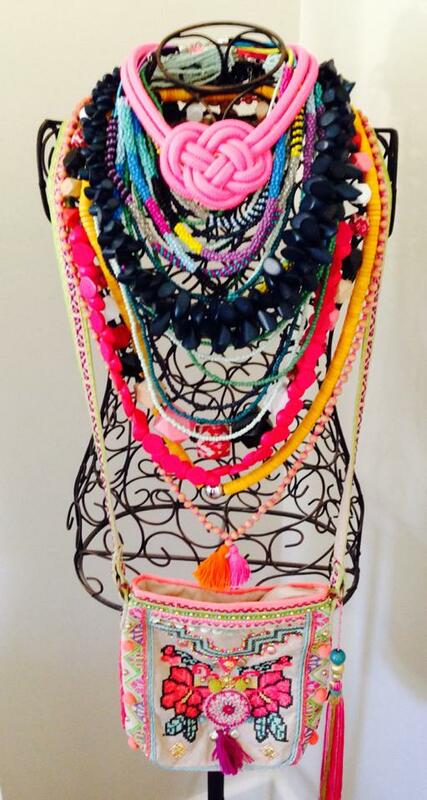 It stores bigger, bulkier necklaces and can even take a few bags. I’ve seen smaller versions (that sit on a dressing table) around the traps too that don’t hold as many pieces but that can be useful. 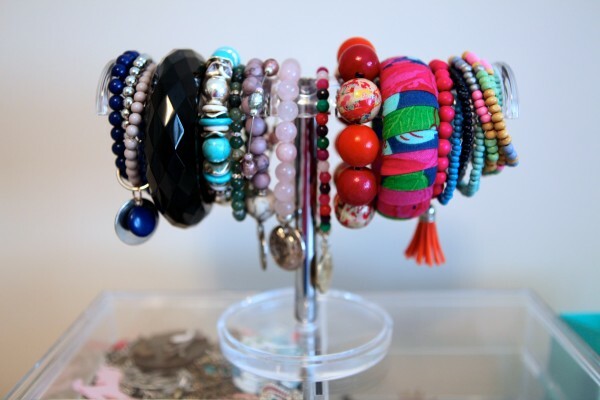 I love my bangles but storing them is a challenge as I tend to gravitate to chunky bangle sets or a themed arm party. I’ve got a couple of ways in which I store them. The first is the unit below- the Allure Bangle Holder ($22.95) from Howard’s Storage World. I’ve often thought that a less expensive and practical option to hold chunky bangles would be one of those metal paper towel holders. Below, I have stored some of my bulkier sets in a ceramic bowl. You can find these in gift shops and they are relatively inexpensive. 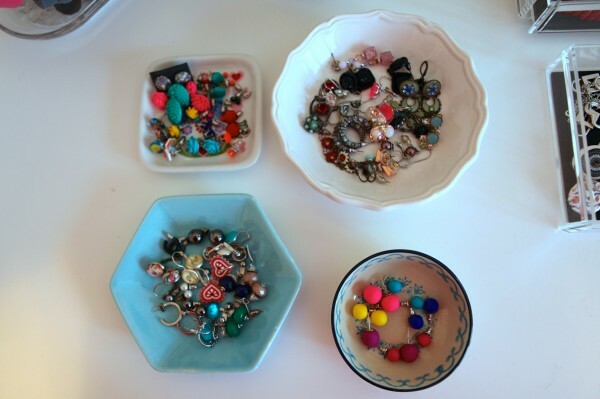 I have quite the collection of earrings and store them in a few different ways. 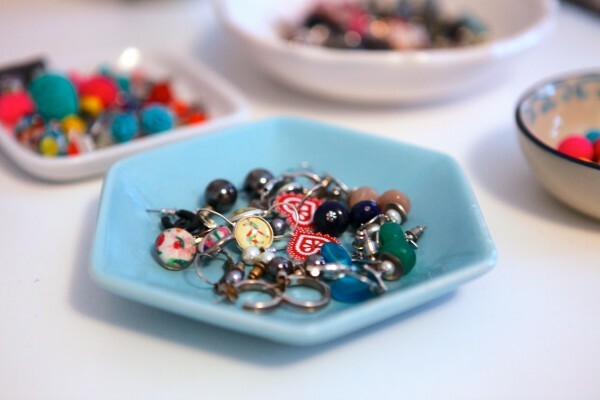 When I did my most recent jewellery tidy up, I decided to group my stud earrings according to occasion and style using ceramic dishes collected over the years from Made in Japan, Sportsgirl and Mozi. The blue dish below is actually a Mozi soap dish. And yes, if you are wondering, I am on the OCD end of the spectrum! My earrings with hooks sit on a couple of tin cups which a girlfriend gave me for my birthday many years ago. By hanging them up in their pairs I can see them all at a glance. For similar, try Ishka or an Indian handicraft store. The unit below (Allure Deluxe Drawer Chest – $82.95 from Howard’s Storage World), is the Big Daddy of jewellery storage and was a big investment. It houses my most sentimental and delicate pieces of jewellery including my ceramic Angus & Celeste earrings, dressier earrings, cocktail rings, sentimental pieces bought on holidays and anniversary gifts from Mr SnS. There are four small drawers and two large drawers, so it holds a reasonable amount and I put the bangle holder on top to save space too. 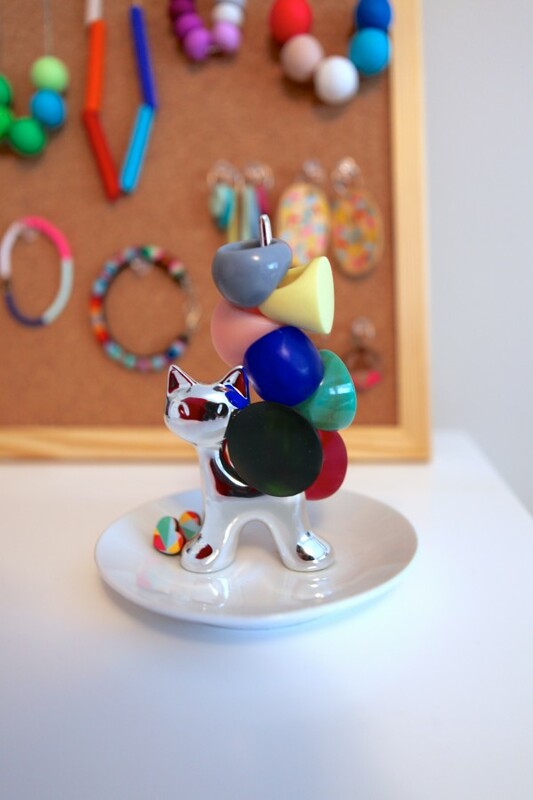 My very thoughtful 5 year old bought me this cat ring holder in his very first Mother’s Day Stall recently. It’s not necessarily what I would have chosen however it performs its job admirably and I know Mr 5 is chuffed to see it there. Below, this little white wooden jewellery tree ($22.95) from Howard’s Storage World houses a couple of necklaces and some of my resin/plastic/wooden rings. 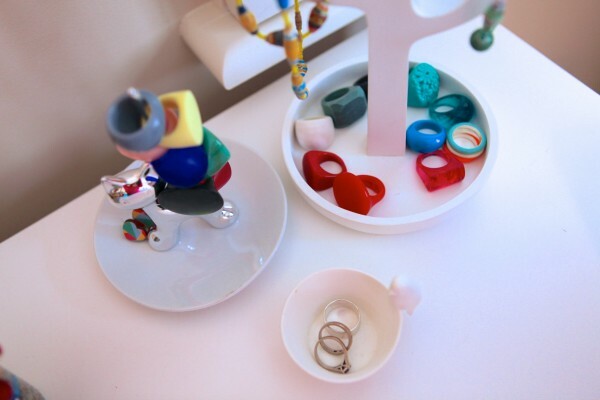 The smaller porcelain dish from Have You Met Miss Jones (a gift) is where I keep my wedding rings. For similar, try these. 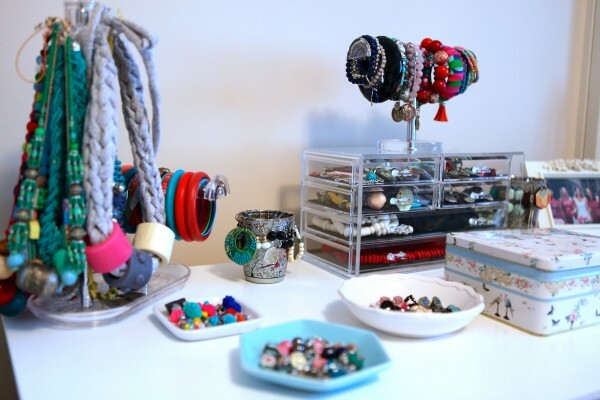 It’s not easy to find a place to store headbands, head pieces and bulky jewellery. 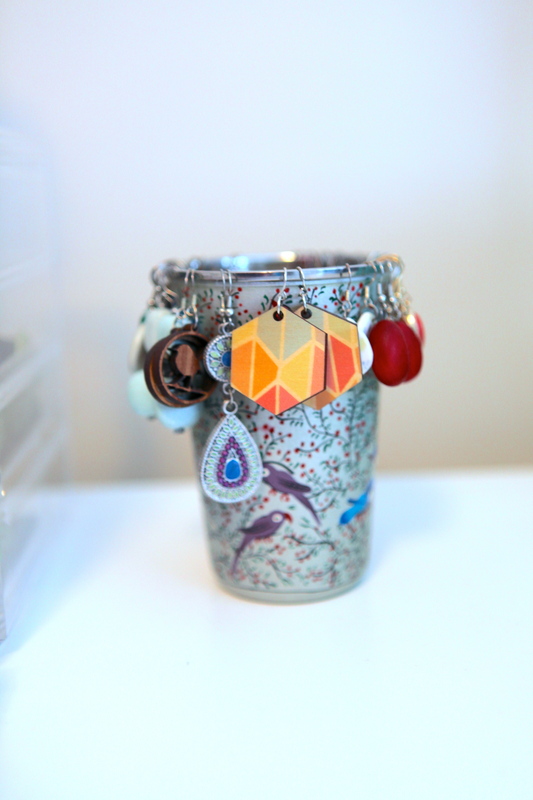 I bought this Nina Campbell print tin box a few years ago and it stores my brooches and bulkier pieces. 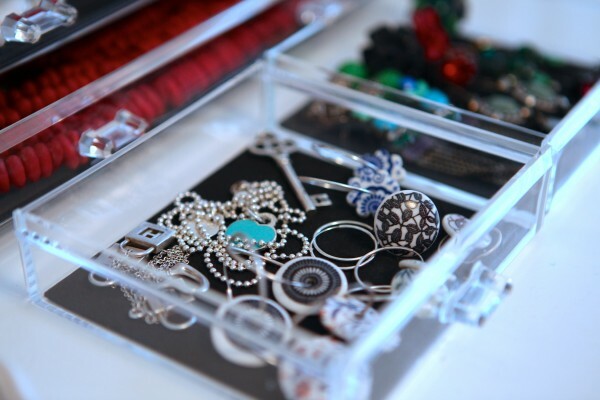 For a similar sized jewellery box, try this. 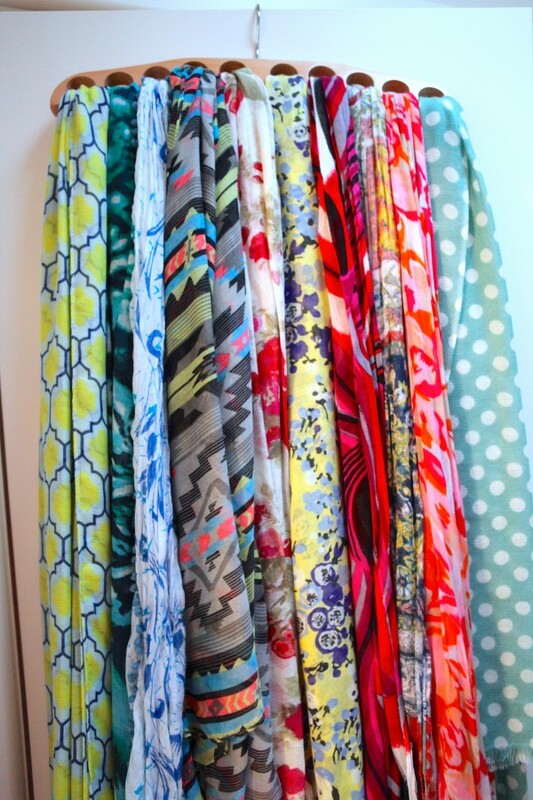 I have loads of scarves and store them in a few different ways. Most of them are kept on this Breton Hat Rack, which I picked up at an end of season sale from Freedom for a song. I don’t use it for hats obviously but it is perfect for my scarf collection and I often hang up outfits I’m planning to wear on this as well. It’s a kind of scarf Lazy Susan. 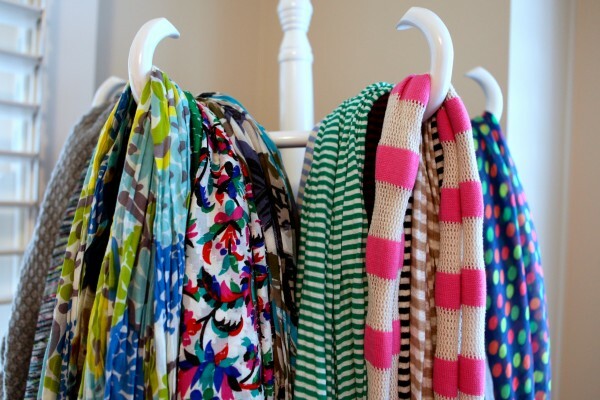 Before I found the hat rack, I used to make do with this scarf hanger (below, $11.95 from Howard’s Storage World). Depending on the thickness of the scarf, it may be possible to fit two scarves in each hole. 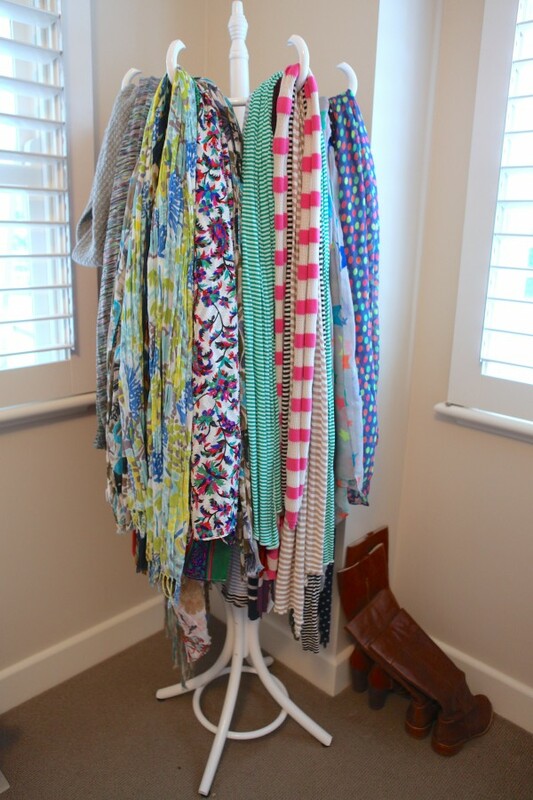 Otherwise, you can store ten scarves on it and hang it on the back of your bedroom door or in your wardrobe. 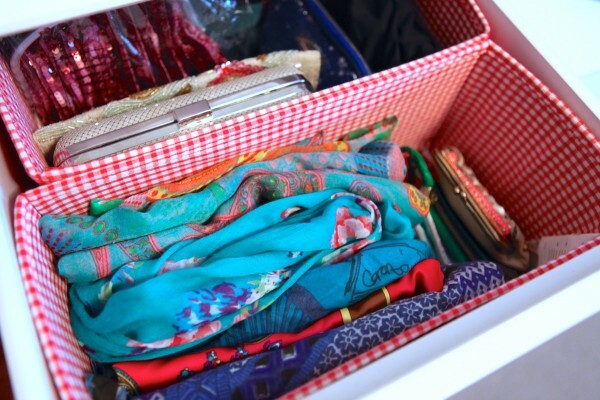 I have also folded up some of my scarves and put them in a draw in my tall boy in these IKEA drawer dividers which I originally bought for the kids’ change table. So how do you store your accessories? What do you find the most difficult to store? What, of the above, would work for you?